We’re loving this ~lewk~. Take note fashionistas, Allison Williams channeled her inner school girl yesterday, and it SO works. Really, what can’t Williams make look good? On Wednesday, Williams attended the TimesTalks: a Final Farewell to HBO’s Girls event and of course she looked flawless. The 28-year-old actress gave us serious school-girl vibes in a bold, orange frock, trimmed in black. Plus, her shoes are like a menswear version of the classic Mary Jane and we’re in love. The Peter Pan Live! star donned a Fendi dress that is clearly a sassy take on your old-school school girl ensemble. Our favorite detail is the dress hemline and collar, which is made more sophisticated by the cutout detailing. It’s so fresh and fabulous. Williams shared a glimpse at her look on Instagram as well, attributing her facial expression to Girls creator, Lena Dunham. The Connecticut native wasn’t the only star of the HBO series in attendance, becuase all four of the leading ladies showed up to chat about the show. In fact, both Dunham and Williams shared a group shot online from the event. "Only silver lining to saying goodbye to Girls: seeing each other a lot. Here we are before our @timestalks tonight — moderated by the one and only @jennydeluxe. I will keep promoting this show for years if it keeps us together," Williams captioned the same group photo from the night. 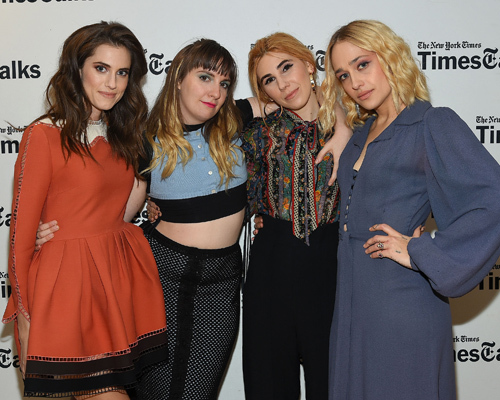 Each of the women including Williams, Dunham, Zosia Mamet and Jemima Kirke looked fierce at the NYC chat. We’re still a little more obsessed with Williams’ doll-like appearance however, since it is SO stylish and chic. Plus, it’s totally something her on-screen character, Marnie, would approve of…don’t you think?